Throughout his esteemed career, Marl Young was known for breaking ground. A civil rights leader within the American Federation of Musicians, he was instrumental in the historic merger of the former all-black Local 767 and all-white Local 47 in the 1950s, which set the precedent for desegregation within the entire musicians union of the United States and Canada. 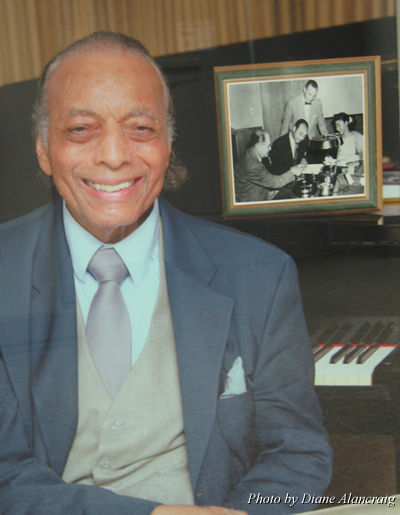 In 1970 he became the first black music director of a major network television series, “Here’s Lucy.” Young served as a longtime director of the Los Angeles musicians union and remained an activist until his retirement in January 2009. He died on April 29, 2009, at age 92. Born in Bluefield, Virginia in 1917, Marl’s family moved to Chicago in 1923. He began teaching himself to play the piano at the tender age of 6. His family quickly saw he had a natural talent and started Marl with piano lessons. He began playing professionally at 14, and by 16 was already a card-carrying union musician. In 1941, Marl started rehearsing and writing music for night clubs and floor shows at the Rhumboogie Night Club in Chicago, where he wrote arrangements for Benny Carter. He decided to move to California in 1947. He set out in his beat-up Pontiac, looking forward to a new job with Louie Jordan, who promised to hire Marl as Bill Davis’ replacement. Arriving with all of $15 in his pocket, expecting to start working right away, Marl got to the studio only to learn that Louie, who was unsure when Marl would be arriving, had already hired somebody else. As fate would have it, Martha Davis of the Martha Davis and Spouse act was there at the studio and offered Marl a job writing arrangements for her recording session. A month later he began working his first regular job at the Last Word on Central Avenue with a band playing for Jimmy Witherspoon. At this time Marl joined the black musicians Local 767, located at 1710 Central Ave. He soon became deeply involved with the movement to unite 767 with the white Local 47. Sounding sharp and articulate as ever, Marl discussed his time working toward this amalgamation from his home by telephone. This would soon change in the early 1950s, after Marl moved to Los Angeles. Marl spent many late nights doing strategic planning along with Benny Carter, Buddy Collette, Estelle Edson and many others. “Over a period of three years we worked hard enough that we got the vote that was needed,” he said. In 1952 he wrote the merger agreement that the two unions later voted upon. In January 1953, Local 767 voted in favor of the amalgamation by more than a two-thirds majority. 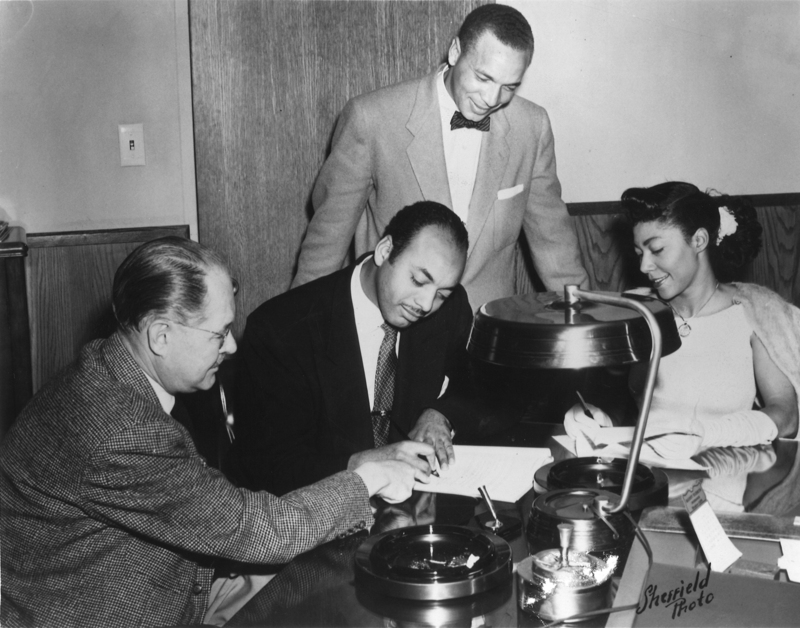 The two Locals officially merged as one April 1, 1953, forever erasing racial segregation within the Los Angeles musicians union. “When we achieved our amalgamation, then it became evident to the AFM that segregation was on the way out,” said Marl. “That’s when they started their civil rights movement.” Local 47 was the first to amalgamate within the AFM, setting the precedent for which every other segregated Local would follow. In 1957, Marl became the first black member of the Local 47 Board of Directors, remaining in this position for four years. During this time Marl got the biggest break of his career. In 1958 he received a call from singer Marilyn Lovel asking him to accompany her on an audition for the Lucille Ball-Desilu Workshop Theater. After performing her two numbers, she was asked to come back — as was Marl, which was highly unusual, as accompanists were not technically considered as In 1959 he began doing the basic arrangements for the workshop theater. Then in 1962, he was asked by Desi Arnaz to perform as pianist in the show’s warm-up band for the studio audience, and continued to work on the show for several years. In 1970 Marl became the first black music director of a major network television show after the death of longtime “Lucy” music director Wilbur Hatch. In this new capacity, Marl decided to hire three black musicians for the show, telling executive producer, Lucy’s then-husband Gary Morton, “I would like the people to understand me when I work for them. I am going to integrate the recording orchestra.” He hired Jackie Kelso on sax, John (Streamline) Williams on trombone, and Melvin Moore on trumpet. In 1972, Marl again ran for Local 47’s Board, and won. After “The Lucy Show” came to a halt in 1974, he decided to run for the full-time position of Local 47 Secretary and won by a landslide, serving for eight years — all the while serving on numerous arts, entertainment and advisory committees, including NAACP, Democratic Minority Conference and California Arts Council. Many of the Local 47 Bylaws in effect today were written while Marl was chair of the Local’s Legislative Committee. This entry was posted in Features and tagged #TBT, amalgamation, Black History Month, Local 47, Local 767, Marl Young on February 7, 2018 by admin.